Lively and engaging animated adventure with likeable characters, superb vocal performances, pacey direction and a strong eco-friendly message, though it's all rather straightforward and parts of it feel underdeveloped. 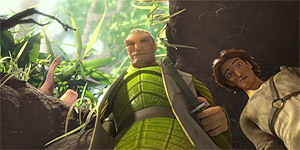 Directed by Chris Wedge, Epic (3D) is loosely inspired by the best-selling novel by William Joyce (The Leaf Men and the Brave Good Bugs) and is set in an enchanted forest where an army of good-hearted Leaf Men, led by Ronin (Colin Farrell) are sworn to protect Queen Tara (Beyoncé Knowles), who controls the life force of the forest. The Queen is under constant threat from the evil, forest-destroying Boggans, led by the sinister Mandrake (Christoph Waltz), who will stop at nothing to get hold of the Queen's magical rosebud, which holds the key to the forest's survival. When grieving real-world teenager MK (Amanda Seyfried) goes to stay with her estranged, forest-obsessed father, Professor Bomba (Jason Sudeikis), she is magically miniaturized and finds herself charged with looking after the magical rosebud. Instructed to take the rosebud to mystical caterpillar Nim Galuu (Steven Tyler), she joins forces with Ronin, strong-headed rebel teen Nod (Josh Hutcherson) and rosebud-protecting snail and slug Grub and Mub (Chris O'Dowd and Aziz Ansari), hoping that a magical ceremony involving the rosebud will restore her to her normal size. The voice cast are excellent, particularly Farrell (who opts for his own Irish accent) and Waltz, who also keeps his own unmistakeable voice and is clearly having a wonderful time as Mandrake. There's also strong comic support from both O'Dowd and Ansari (both, oddly, managing to easily adapt their standard screen personas to slug and snail form), while Seyfried makes a solid, likeable lead as MK. The animation is lively and fast-paced throughout and the character designs are intriguingly detailed, particularly in the way both the Leaf Men and the Boggans wear armour fashioned from their surroundings; the way the Boggans move is also a little disturbing, as it's deliberately designed to echo the movements of swarms of creepy-crawlies. On top of that, Wedge pulls off both exciting action sequences and strongly emotional moments, without resorting to too much in the way of sickly sentimentality. The main problem, at least for adults, is that the film is an extremely straightforward good versus evil story and there's no real complexity to it. It also feels a little underdeveloped at times (Pitbull's gangster toad character is introduced and then disappears again almost immediately; Mandrake loses his son and it's treated as nothing) and Beyoncé's performance is embarrassingly weak compared to the rest of the cast, to the point where you strongly suspect she was a contractually obliged late addition to the line-up (her character doesn't seem as well-animated as the others either). A few quibbles aside, Epic (3D) is an enjoyable animated adventure that should appeal to both children and dragged-along adults alike.